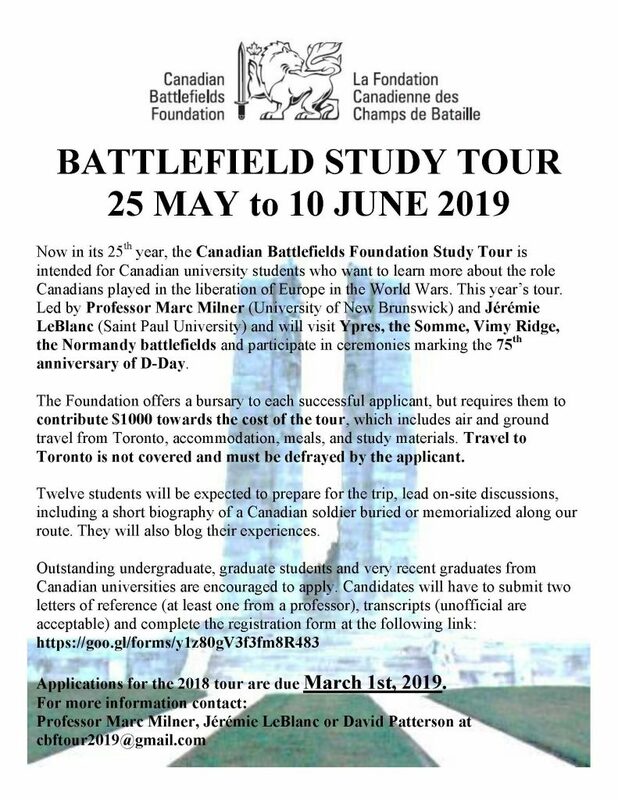 Canadian Battlefields Foundation > News-Events-EN > CBF 2019 Battlefield tour poster and application is OPEN! Now in its 25th year, the Canadian Battlefields Foundation Study Tour is intended for Canadian university students who want to learn more about the role Canadians played in the liberation of Europe in the World Wars. This year’s tour. Led by Professor Marc Milner (University of New Brunswick) and Jérémie LeBlanc (Saint Paul University) and will visit Ypres, the Somme, Vimy Ridge, the Normandy battlefields and participate in ceremonies marking the 75th anniversary of D-Day.